Amid all the announcements Google (s goog) is making at the Google I/O conference in San Francisco this week are three APIs that show Google wants to make the most of the sensors in Android devices and will let developers incorporate rich location data into their apps. The first API, called Fused Location Provider, will use very little battery power — less than 1 percent per hour, said Hugo Barra, director of product management for Android — to share Android device users’ locations. The second API is Geofencing, which “lets you define virtual fences around geographial areas” and creates triggers whenever a user enters or exits a location. 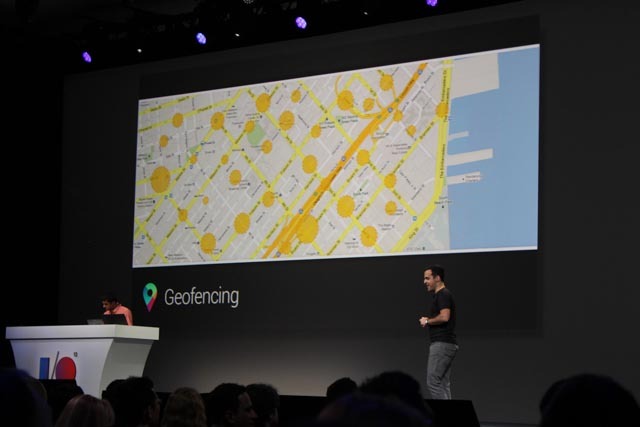 And, get this, users can have “over 100 geofences simultaneously active per app,” Barra said. Finally, the Activity Recognition API will track users’ physical activities and uses machine learning to determine exactly how users are moving — whether they’re walking, running, riding in a car or just idling, Barra said. Taken together, the APIs could let companies gain far more intelligence about their customers through Android apps, without annoying them with user-experience issues like battery drain. At the same time, apps making use of these APIs could make consumers more conscious of how and when they are being tracked — can companies see where customers are all the time? — and could lead to new discussions and best practices around privacy. Developers interested in using these APIs can sign up to get access to them through Google Play Services today.